FC Barcelona striker Luis Suárez, who scored Barça's only goal in a 2–1 defeat at Deportivo La Coruña on Sunday at the Estadio Riazor, had a clear message after the game. 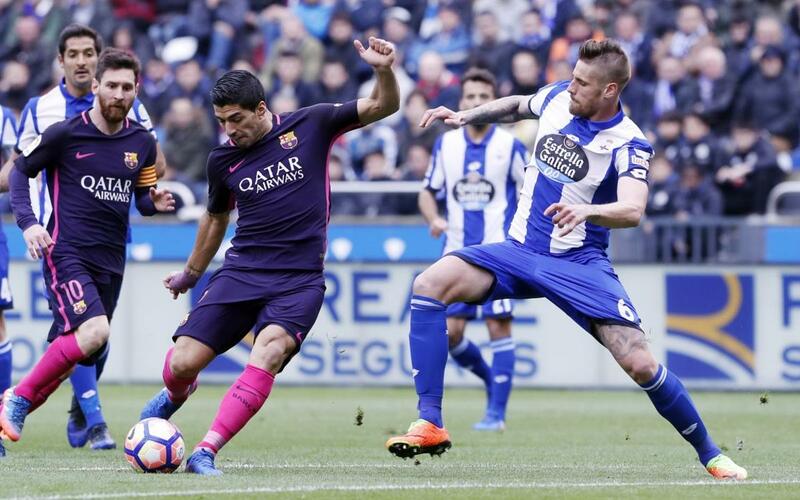 While Barça were fighting to stay atop the table, Deportivo were struggling to stay afloat, and their desperation showed in their tenacious play Sunday. "We tried to control the game, but their goal did too much damage; we couldn’t find the solutions." "Nevertheless, our quick goal to open the second half led us to believe we could turn it around." "Now we have to approach the situation in a calm and relaxed way; there’s a lot of league left." "We weren’t able to play our game the way we like." "Both the players and fans want it all. We’ll keep fighting till the end." "That’s sports. We’re not robots. And after a huge effort like on Wednesday, with all the adrenaline and excitement, it’s tougher to compete." "The other teams play as well, and we have to congratulate Deportivo." "Wednesday’s game is no excuse, the schedule is tough and we have to battle through these weeks in which you play every three days and each game requires a huge effort." "In the last few months it’s been shown that you can turn it around. I’m convinced we have a good chance to win it." "I’ll have to take some time to look at the game and break it down, but it was tough for us to get scoring chances from the outset." "We had a few chances to take the lead, but they ended up going ahead and after that things got really tough." "In the second half, we could have drawn level and I thought we were starting to heat up but it was too intermittent." "Corner kicks? We have to look at all the stats. That’s the way it went today, but we’re solid in that department." "At the beginning, you could see it was going to be a tough game. We knew that beforehand. We started off well, trying to create danger, which was tougher at the start because, physically, they were stronger." "We lacked more of a flow, our opponents got more and more confident and we also lacked clarity." "It was tough from the beginning. There’s no way to justify the defeat. We have to accept it and think that there are still a lot more games left." "It’s tough to take because it was important to stay on the winning path, but it wasn’t to be. They took advantage on a pair of corner kicks and the could have had another on the counterattack." "It wasn’t hard to come back to reality. One someone who has experienced with we did this week knows what it means." "Us professionals know how hard it is to attain each victory. There are no easy games. The teams at the bottom are more dangerous as the weeks go by. We have to have a very good stretch run to fight for championships." "We thought it would be a tough game because of everything that’s gone on. The last game can always play a role. Euphoria is always preferable to pessimism, but we were aware of the difficulty." "I foresaw maximum difficulty. I foresee it every week, and after Wednesday, even more so. At this point of the season, with teams that need points, it’s hard. It was for us and it will be for any team."